Kusatsu Hot Springs: The Very Definition of Quality Stating the facts as they are… spring quality we are proud of. Due to its naturally flowing strong acidic water, there are many anecdotes that tell the story of one of Japan's prominent spas. Here is a look at its quality. As evidenced by the common expression "Kusatsu yoi toko, ichido wa o-ide" (Come to Kusatsu once in your life, since it's such a wonderful place. ), there are reasons why it is revered as a famous spa. 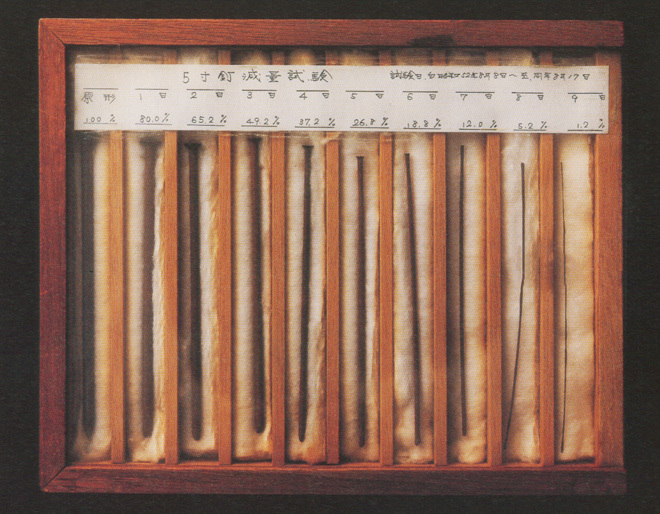 In only ten days, a 6-inch nail left in the hot spring is reduced to a mere skeletal shard (as seen in the photo on the right). A 1-yen coin (made of aluminum) would dissolve without any trace in only a week. 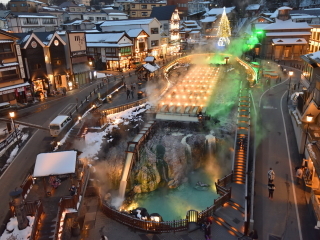 The secret to Kusatsu Onsen's sterilizing powers is its strong acidity. Experiments have proven e-coli bacteria cannot survive for even one minute in Kusatsu's spring waters, and virtually all other bacteria and fungi are unable to proliferate and soon die. This is why these waters are reputed to have beneficial, therapeutic affects. A good hot spring is like a good doctor. Kusatsu Onsen is proud of its century long reputation that "it can cure any ailment except heartache." Relief of neuralgia, muscular and arthritic pain, skin ailments, stiff shoulders, bruises, sprains, chronic fatigue, chronic women's diseases, diabetes, high blood pressure and hardening of the arteries; promotion of general health and convalescence, etc. The yubatake is the symbol of Kusatsu. Here, hot water from the spring's origin gushes down wooden channels made from five-centimeter thick pinewood still containing large amounts of resin. Fine quality pinewood or Japanese cypress rich in resin is the optimum choice of material to continuously withstand acidic spring water. This is why many inns still have old, wooden bathtubs made of similar materials. Thus, the quality of Kusatsu's spring water also serves to create a typically rustic hot spring atmosphere. 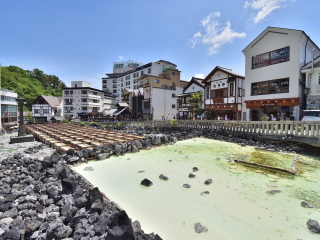 Kusatsu Onsen boasts the largest natural output of any hot spring in Japan. Trails of steam seen rising into the air all over the town enhance any traveler's experience. Let's take a look at this incredible amount of water that enables the continuous flow of the natural hot spring. Kusatsu Onsen is rightfully proud of both the quality and quantity of its waters. 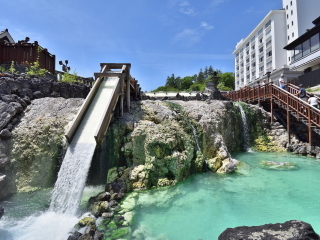 In Kusatsu, more than 32,000 liters of spring water gush out every minute – the equivalent of some 230,000 barrels per day. The spring's source is Mt. Shirane, an active volcano. This makes it possible for all Japanese style inns, hotels and spa facilities in Kusatsu Onsen to continuously provide their guests with spring water that doesn't need to be reheated, diluted or otherwise adjusted. This lavish amount of water allows visitors to have a luxuriously sensational experience. 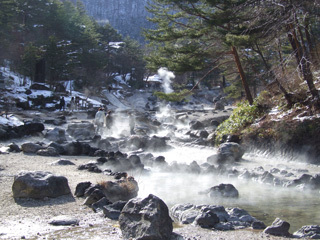 Yubatake – "a field of hot water" – is the symbol of Kusatsu. 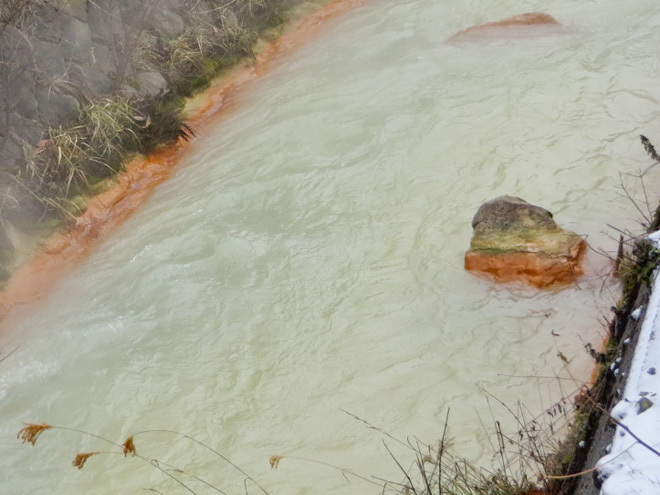 Here, something called yu-no-hana (literally "sulfur flowers" or mineral salts) is formed when the massive quantities of spring water are exposed to the air. This natural bath salt is removed from wooden tubs four times a year while the water flow is temporarily halted. Carefully removed by hand, the bath salts are packaged in cone-shaped containers, whose annual production totals only seven to eight thousand. Visitors who purchase them can enjoy the fruits of this plentiful, precious hot spring at home. The hot springs in Kusatsu are put to various uses. In order to lower the temperature of the scalding hot Bandai hot spring to a temperature suited to bathing without diluting the water, a heat exchanger is used to pour cold tap water on the pipe through which the spring water flows. The tap water, which rises in temperature during the process, is then used to melt snow on roads and is supplied as hot water to Japanese style inns and private homes. Another example is spring water that flows into the Yukawa River, which is neutralized with natural coal to maintain an environment suitable for fish. 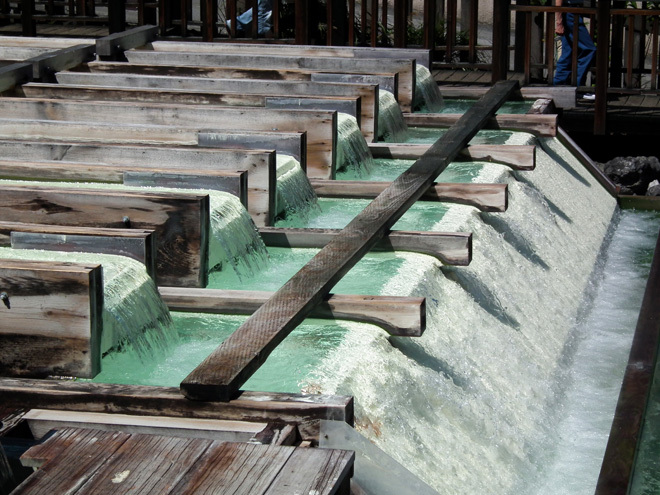 These are all facets of Kusatsu's philosophy of "onsenism," principles to maintain the quality of our hot springs. Copyright (C) 2016 KUSATSU-ONSEN All RightsReserved.